Introducing Covr, the seamless Wi-Fi solution that’s the perfect fit for your modern home. It blankets every square inch of your home with high speed AC1200 Dual-Band Wi-Fi. With Covr, you enjoy Wi-Fi that’s stable, consistent, and truly seamless. 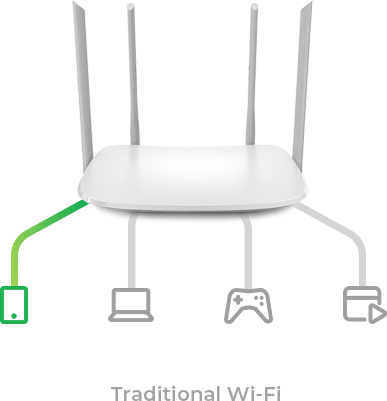 With 1,200 Mbps Wi-Fi, MU-MIMO technologies, 2×3 (Rx) antenna at its core. Covr’s three discreet Covr Points cover up to 5000sq. Wi-Fi dead zones are now a thing of the past. With Covr, there’s just one wireless network name (SSID) for your entire home, no matter where you are. Gone are the days of only being able to use Wi-Fi in certain areas of your home: Smart roaming lets you move around the house while always being connected to the strongest signal available. Forget about traditional Wi-Fi extenders which require you to connect to different networks as you move around, Covr ensures your entire home is covered by a single, seamless network. Having one Wi-Fi name (SSID) means once you connect, your connection is seamlessly maintained as you and your wireless devices roam around your home. As you move from room to room and floor to floor you’ll experience uninterrupted Wi-Fi. Buffering, drop-outs and deadspots are now a thing of the past. Unlike other whole home Wi-Fi systems that use only 2 receiving antennas, Covr has 3 receiving antennas to detect and receive more data from all your devices. You enjoy seamless connectivity no matter where you are in the house. of your home Wi-Fi network than ever before. 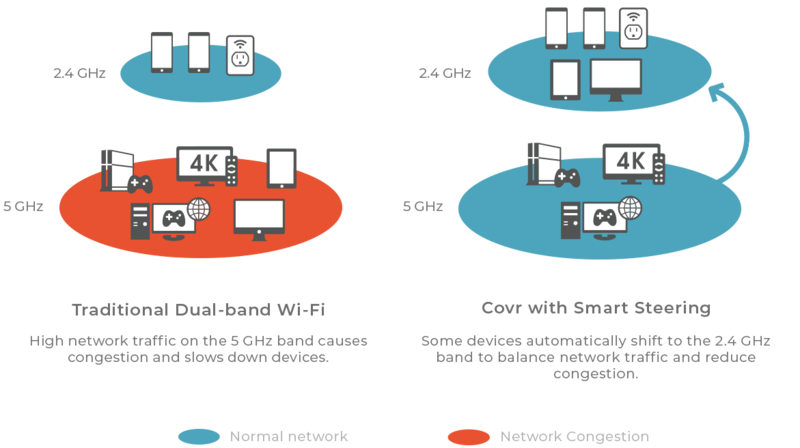 band and even move devices between Wi-Fi bands when the network experiences congestion. without you l ifting a finger. The Parental Control feature can be used to restrict network access to client devices. Easily setup and manage Covr from your smartphone or tablet using the D-Link Wi-Fi App. and creating a Wi-Fi guest network is easier than ever with the intuitive user interface. Different colors suits different room. "D-Link’s Covr C1203 is ideal for homes which require seamless Wi-Fi in all its areas. It is easy to set up and manage and has the capability of providing seamless connectivity to all of your devices." "So if you’re looking for a solution to improve your Wi-Fi connection around the home, this product is definitely worth considering." "Covr was providing a stronger signal pretty much all over the house"
"Mesh networking is certainly not unique to D-Link, but the COVR system is well designed and performs well. " "We’d definitely recommend the D-Link COVR C1203 if you’re keen on finding a reliable and effective router that won’t burn your budget." "The nodes look good and performance will meet the needs of most home and small office users." "D-Link COVR-C1203 is seamless, smart, and reliable. It breathes life to the dead corners of your home or office, spots where connectivity seems to be in the oblivion and it does this seamlessly." "Compared to other MIMO offerings this is an excellent investment especially as some competitors are over $100 more expensive. 4.5/5!" "D-Link's latest mesh router offers decent performance and features at an attractive price. 4/5"
"Speeds I tested were top notch, giving me 90-95% of my actual modem speed at the furthest reaches of my home." "The D-Link Covr-C1203 is a very affordable dual-band whole-home mesh Wi-Fi system that looks good and works great." "Fast, consistent wireless coverage throughout the house. The user-interface has plenty of customisation features for more technically astute users, whilst still being easy for novices to set up." "It offers fast, consistent wireless coverage throughout the house." "It’s a mesh network product which means your 4K UHD content from the likes of Netflix will be delivered faster than older models Wi Fi systems." "If you’re looking for an affordable solution to fix Wi-Fi dead spots that receive no signal in your home, D-Link’s Covr...is the product for you."